Welcome back for yet another project for the Spring Coffee Lovers Bloghop! And, yes, that’s a picture of the real Alice – Alice Liddell – who was the inspiration for Charles Dodson’s books (You might know Dodson by his pen name: Lewis Carroll). In case you’re wondering, the smaller book is Alice’s Adventures Under Ground and the larger one is More Annotated Alice. 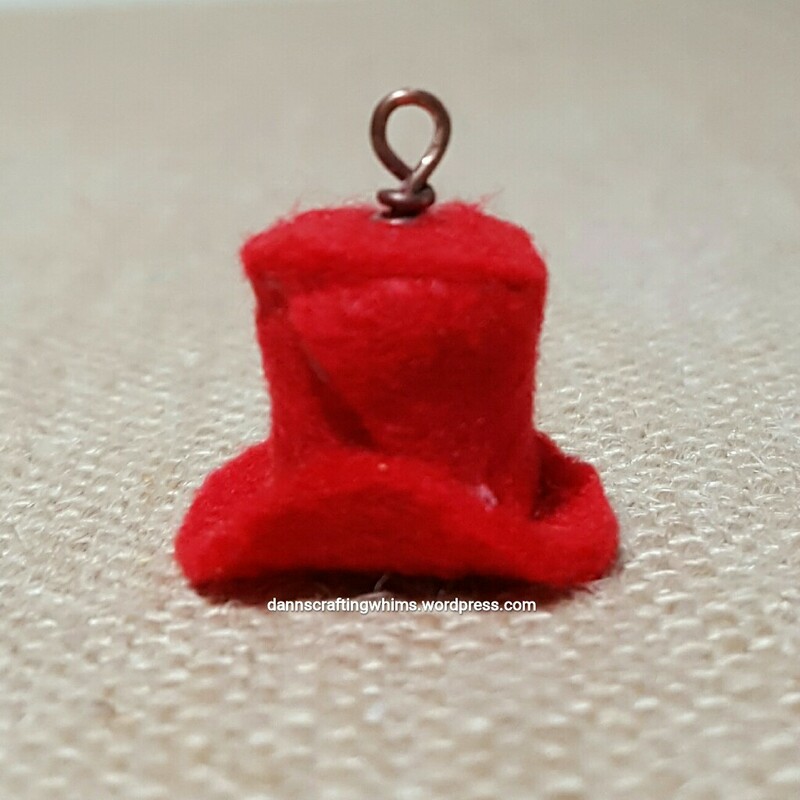 Let’s start with the Mad Hatter’s hat that I made from felt. Since I cut it freehand, rather than draw you a template, I took a picture on a grid so you could freehand your own. 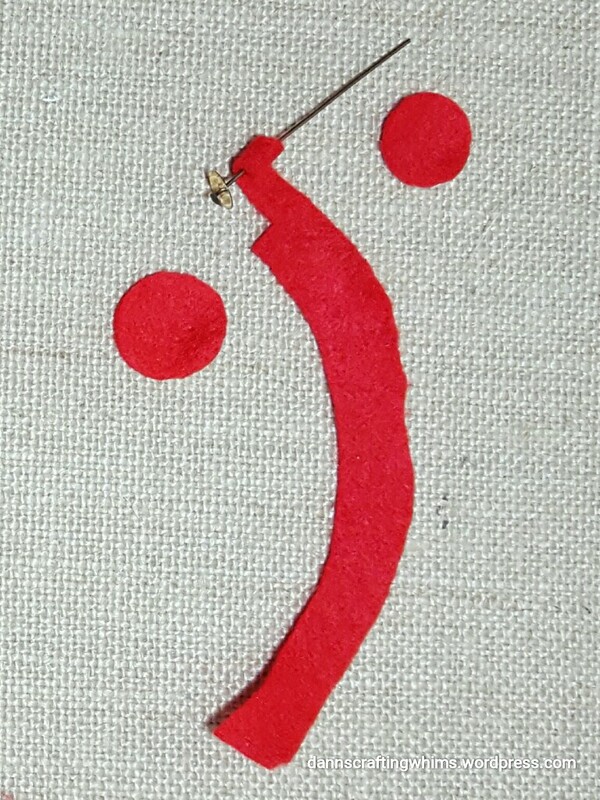 There’s some extra felt for the top part to make it end up fatter than the bottom. 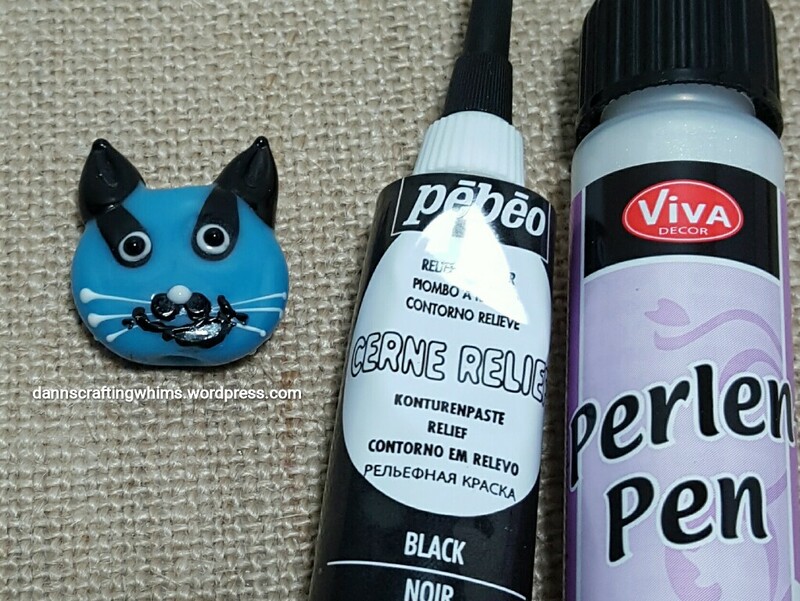 Place a dot of Fabri-tac on the felt and start winding the felt around a headpin with a sequin on it (to keep it from pulling through the felt). You will want to leave enough room for the full width of the felt when you get there. Once finished, use a dab of glue to hold the end. Glue the smaller circle on top and trim to fit. Glue the larger circle on the bottom. You will want to put your ‘sash’ of ribbon on first, before rolling the sides up and securing with a dot of glue. (Ask me how I know! Lol!!) 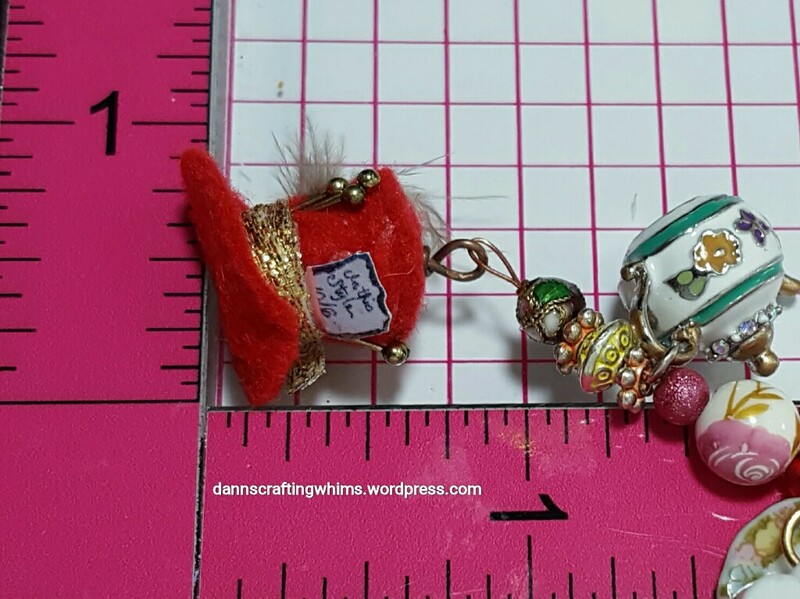 Then shape the top of the headpin into a charm loop. There are plenty of tutorials on how to do this on the net. I cut off some rounded head pins for the hatpins, printed out the chit to tuck under the band ,and put some small feathers in the opposite side to finish it off. That rabbit is just a little something I found in a bin at Michaels, but what’s cool about him is that, in true Alice in Wonderland fashion, he will grow up to 5x his size if you put him in water and shrink back when dry. I just pierced his ears to add the jump rings and glued on the clock with E6000. The ‘drink me’ potion is just a couple of drops of water and glitter in a green flask. 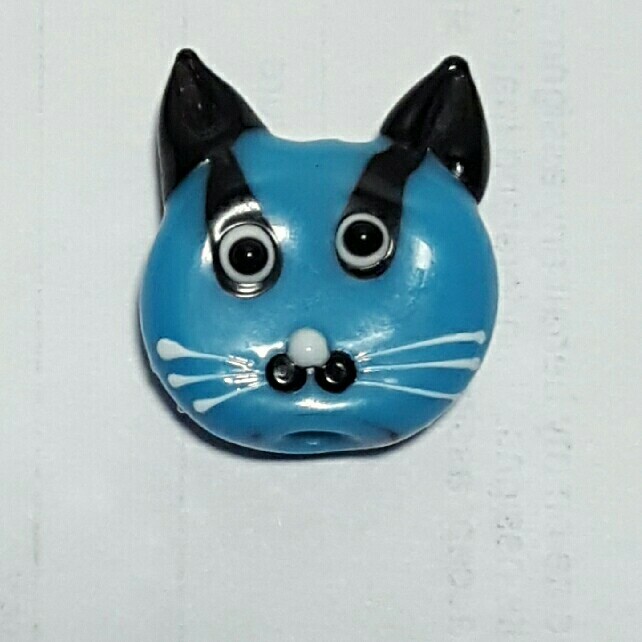 The glass cat charm needed a grin and, since the glass accents are dimensional, I pulled out my Pebeo Cerne Relief and drew one in. Once dry, I gave him some pearly whites with a Viva Decor Perlen Pen. 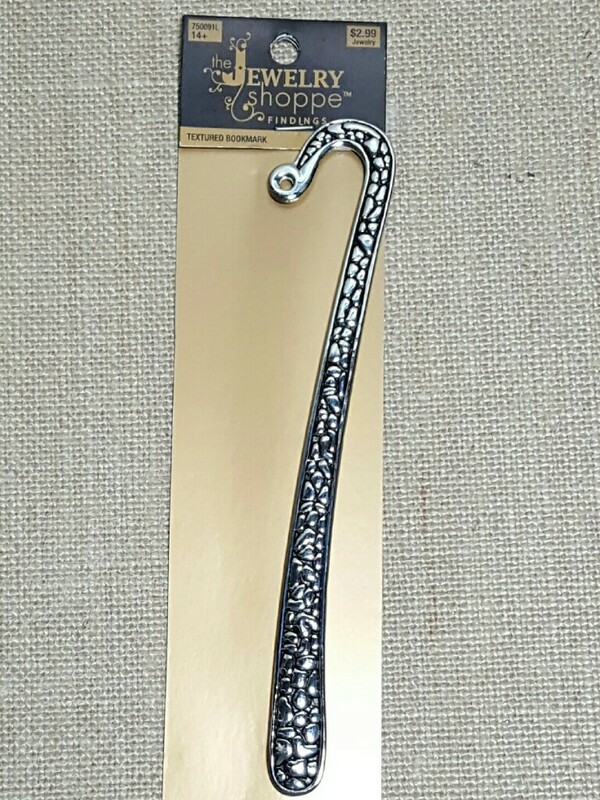 the bookmark itself was textured silver. I wanted a mossy ‘grouting’ and bright cobblestone look, but the alcohol ink kept bleeding onto the green patina I was using, so I ended up going with the bright textured interior. 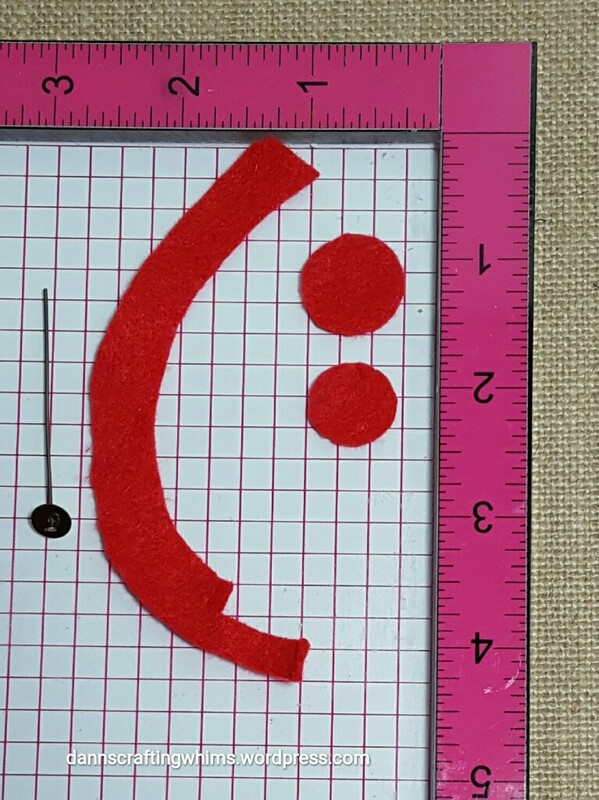 Interesting fact: This felt is made with a polyester fiber made from recycled plastic bottles. What a sweet little Gorjuss stamp set and I really like that Graceful Borders die set! Edited to add: Thank you, MarkerPOP for the privilege of being a top pick! Thank you for hanging in there through this extra long post! I hope you liked the gift set as much as my friend did! I hope to see you again real soon! This entry was posted in Any Occasion Cards, Beading, bookmarks, Cards, Felt, Friendship Cards, Get Well Cards, Jewelry, Papercraft, Thank You Cards, Thinking of You Cards and tagged Adirondack alcohol inks, Alice in Wonderland, Alice in Wonderland beaded bookmark, Beacon Fabri-tac, Bead Gallery Beads, Bead Landing Charmalong, Bead Landing Found Objects, Bead Landing Pemberly, Bead Shop Beads, BeadandArt glass cat bead, beaded bookmark, cardmaking, coffee, Copic Coloring, Copic Markers, Copics, Cousin beads, Cousin Jewelry Basics, Darice beads, Darice wire, Felt hat charm, felt Mad Hatter's hat charm, glass cat bead, Gorjuss Sweet Tea, Gorjusss, handmade cards, iCraft, Jewelry Shoppe findings, Kunin Group ClassicFelt, Mad Hatter, Mad Hatter's Hat, Papercraft, Pebeo Cerne Relief, rangerink, Santoro Sweet Tea, SantoroLondon, Spellbinders, Spellbinders Graceful Borders, Spellbinders Graceful Eyelets, Spellbinders Graceful Frame Maker, Spellbinders Shells Duality, Spring2017CLH, sssmchallenge, ssswchallenge, Tea, Tea Party, textured bookmark, Thermoweb, Thermoweb Sticky Tape, Vintaj Glaze Gloss by dannscraftingwhims. Bookmark the permalink. The bookmark elements are so dreamy and perfect and love this cute card! Thanks for sharing how to do! Such a sweet card! Love the image! 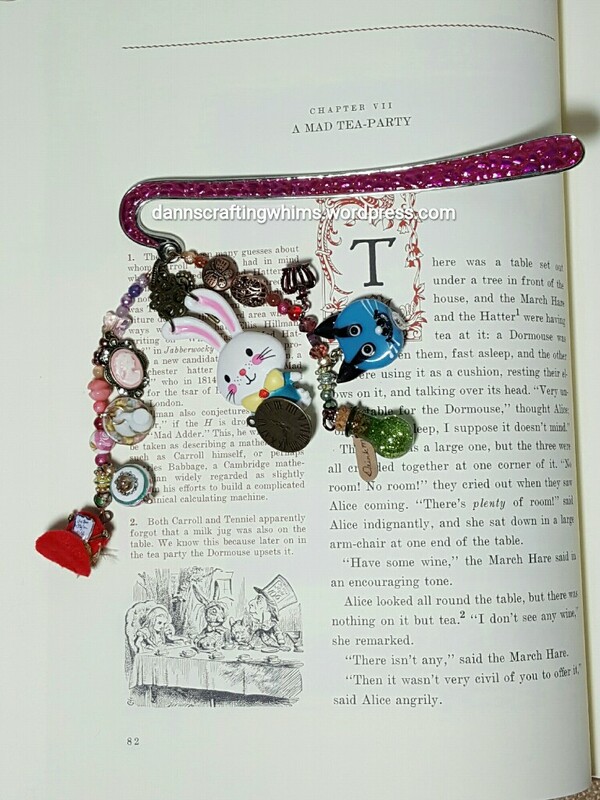 And your bookmark is out of this world! Wow! Love it!! WOW. All the work in your projects is simply amazing. That bookmark is mesmerizing. Your card is adorable, your coloring is awesome and I love the texture. What a wonderful and perfect gift for your Alice loving friend. Love the bookmark. What a super cute card, D’Ann. I love that sweet image you’ve used and the soft muted colors. Wow, D.Ann. So creative. So fun. I’m so impressed with that bookmark. Fabulous! And a gorgeous card, too. Such a sweet little Gorjuss image and card. Wow! I’m really speechless!!! Your bookmark is really adorable!!! Great project!!! 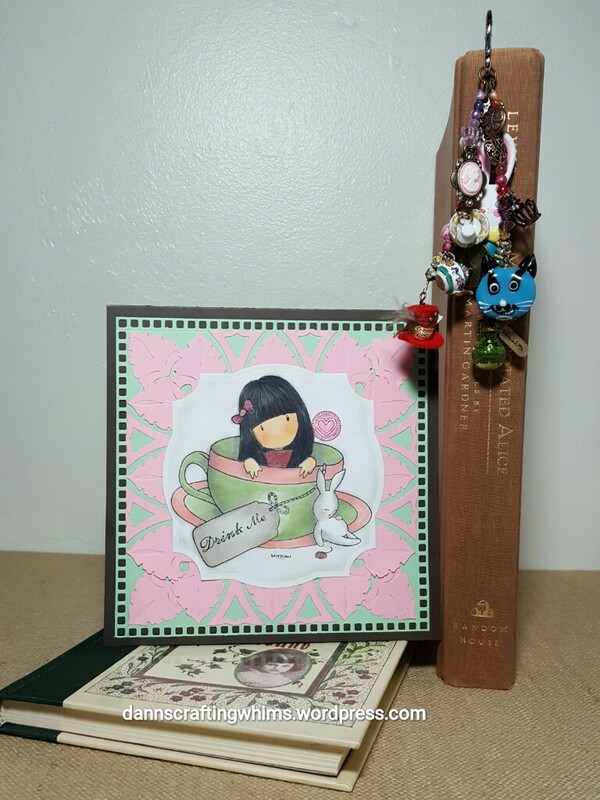 Cute and adorable card and great jeweled bookmark too. Wow, this is a totally wonderful blog post. 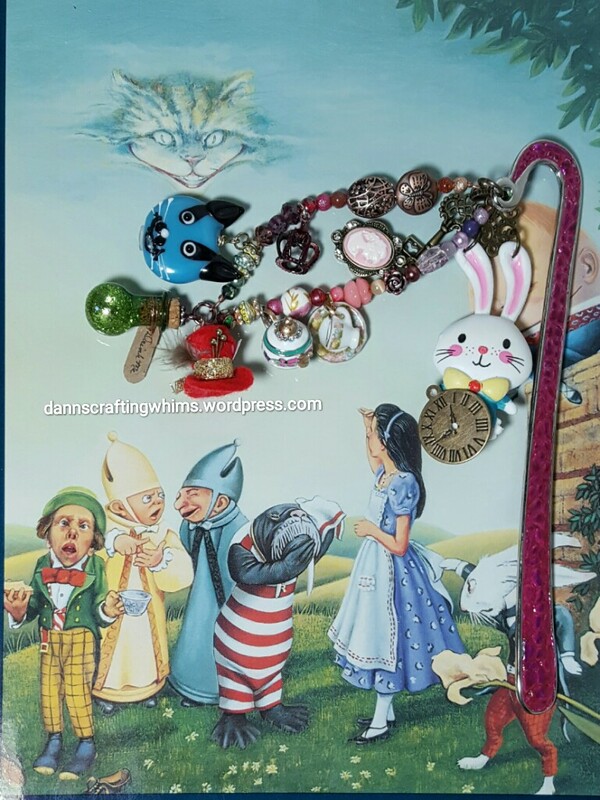 Love your card and all the details of your wonderful bookmark. Beautifully made.